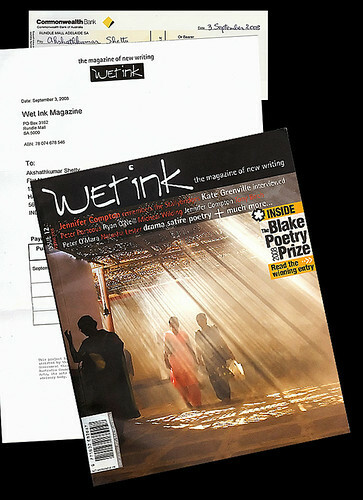 My ‘bless me’ image was selected to be on the cover for Issue 12 - Spring 2008 edition of ‘Wet Ink’ Magazine from Australia. ‘Wet Ink’ is a magazine that’s dedicated to publishing new and exciting writing. You can order your copy online here. Thanks Simon Lownsborough for selecting my image. On Sep 11 2008; I got a email from Photoshelter Collection informing that they are closing down.. this came to me as a very sad news.. I was on PhotoShelter from their start.. and believed they understood photographers.. I guess the business did not work out the way they wanted and was not sustainable. I still believe they dared to do something different .. something that needs to be appreciated and commended.. thank you PhotoShelter for that.. and I wish you all the best for your future. Here is the email I got from them..
We’re contacting you today with some unfortunate news - we will be closing The PhotoShelter Collection, effective October 10, 2008. Going forward, our team will refocus heavily on enhancing our original product, The PhotoShelter Personal Archive, which several thousand photographers use for bulletproof storage and online image sales directly to their own clients. Our financial position remains solid and we look forward to working with the photography community for years to come. More details about timing and the implications for contributors can be found in a personal statement on our corporate blog, and this FAQ document. Just one year ago, we started the Collection with a mission to “change the image marketplace for good.” Since then, we’ve amassed a remarkable global community. We’ve built a unique position in the industry fueled by integrity and a true passion for photography. We’ve held our commitment to fair treatment of photographers with a 70/30 split of every transaction, opened up your access to information through our School of Stock and symposium events, and gave every photographer - regardless of one’s network, location, or level of expertise - a fair shot at selling your work to the industry’s top buyers. However, our approach was insufficient to change buyer behavior on a grand scale and generate revenues quickly enough to satisfy our goals for this product line. While image buyers worldwide appreciated our new approach, the size of our image selection and the incumbent player’s entrenched subscription relationships were a persistent challenge. As a result, we saw few strategic options for the Collection that would allow us to stay true to our commitment to a better deal for photographers and our desire to change the industry. Despite today’s decision, we remain committed to using technology to advance both the art and business of photography. Our team’s energy and innovative resources will ensure that the Personal Archive remains the best online solution to help independent photographers write their own success stories. If you are not yet a Personal Archive subscriber, we hope you will continue your relationship with the PhotoShelter community through that product. We want to express our deepest gratitude to our global community of contributors. We’ve enjoyed a full year of seeing your exceptional images cross our desks, developed warm relationships with many of you through PhotoShelter events, and shared in your excitement when you’ve achieved sales through our marketplace. We’re looking forward to chatting more with you in person and demonstrating some new Personal Archive enhancements at October’s PhotoPlus International Conference. And here is the link for their Press Release. Another interesting read you may want to go through.